How do I start a new course from the Dashboard as an instructor? If you are allowed to add new courses in Canvas, you can start and create a new course from the Dashboard. New courses are created as course shells to host courses for your institution. However, some institutions will have this option disabled and instead provide courses to faculty automatically via SIS (student information system) imports. 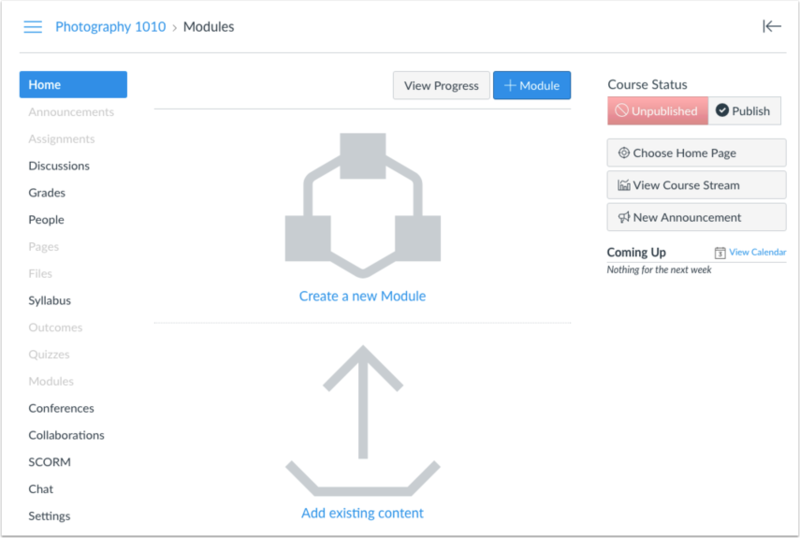 When you create a course from the Dashboard, you will be added to the course as an instructor automatically. Note: If you are not able to start a course as shown in these instructions, your institution has disabled this feature. Contact your Administrator for assistance. In the Dashboard sidebar, click the Start a New Course button. You may need to scroll down to see this button. Note: If you do not see this button in Canvas, your institution has disabled this feature. Add your course name by typing in the Course Name field . If your course name is longer than 21 characters, you can create a course code in the Short Name field . If your course name is too short to create a Short Name, a short name will automatically be created for you. The short name will be displayed at the top of the Course Navigation menu and in the course card in the dashboard. If you have permission to edit the course name, you may be able to change the course name and code later in Course Settings. If you want to set a content license, select the content license drop-down menu . This setting will help Canvas keep track of the default license for content inside of your course. By default all content is considered copyrighted, but you can also release your content to the public domain or choose a Creative Commons license. You can also learn more about licenses and set the license at any time in Course Settings. 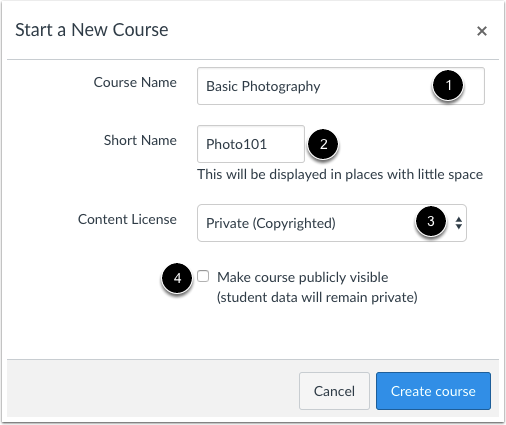 If you want to make the course publicly visible, click the Make course publicly visible (student data will remain private) checkbox . This option will make the course public to anyone with the URL. You can change the course visibility setting at any time in Course Settings. View the new course. Depending on your institution's preference, you can use either the Course Setup Checklist or the Canvas Course Setup Tutorial to populate your course at any time. Previous Topic:How do I use the Canvas course setup tutorial as an instructor? Next Topic:How do I delete a course as an instructor? Table of Contents > Courses and Sections > How do I start a new course from the Dashboard as an instructor? Re: How do I Create a New Course?